The Hawaiian Monk Seal: Driven to the edge of extinction, the Hawaiian Monk Seal has recently been making a comeback in Hawaii. Marine Biologists have long assumed that Monk Seals mostly fed close to shore in the shallow reefs teaming with fish. However, using electronic sensors and cameras attached with flexible glue to the fur of monk seal's backs, biologist have been surprised to discover that these strong and agile swimmers actually bypass shallow reefs to spend weeks at a time in the open ocean - ranging as far as 35 miles from shore and diving at astonishing depths of up to 1500 feet (not even sunlight penetrate this deep). Hunting in these deep, cold, dark waters, the Hawaiian Monk Seals use their snout and heads to overturn rocks weighing up to 25 pounds on the ocean bottom flushing out various fish, eels, and octopus of the same type found on shallow reefs. However, once flushed out into the featureless ocean floor, these fish have less cover and the Monk Seal has a better shot at pursuing and catching them. Perhaps another advantage the Monk Seal has at these depths is that these waters are shark-free. Although adult Monk Seals are agile enough to evade shark attacks, the deep water reduces the threat of attack and also the competition sharks would pose on these two animal's common food supply. After these long and solitary hunting forays in the open ocean, the Hawaiian Monk Seal returns to the warm, sunny beaches of Kauai to rest. 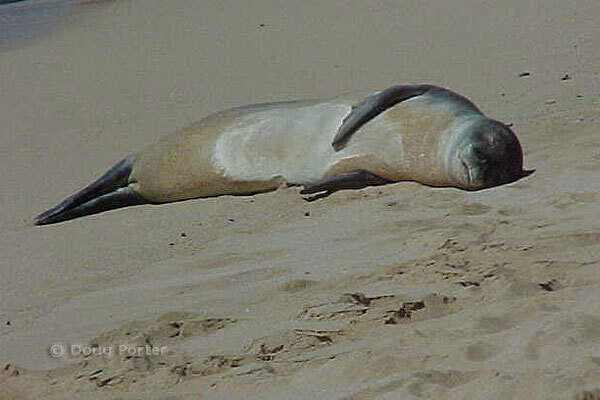 Exhausted, they often sleep for days in the sand just above the surf. Once again a common site on Poipu Beach and various other beaches around the island, slumbering Monk Seals attract scores of curious tourist who will often study a motionless Monk Seal for hours trying to decide if it is even alive. Please don't disturb them, they need their rest and the Hawaiian Monk Seal is protected by law.